Project Description: Marion County’s new stormwater standards required redevelopment projects to provide twice the amount of detention versus new development projects until the redeveloped project met the current stormwater detention standard. The Chemeketa Community College main campus site had minimal detention throughout the campus. As a result, when the college redevelops portions of campus in the coming years, many small detention systems would be spread throughout the campus creating a maintenance problem for the College. 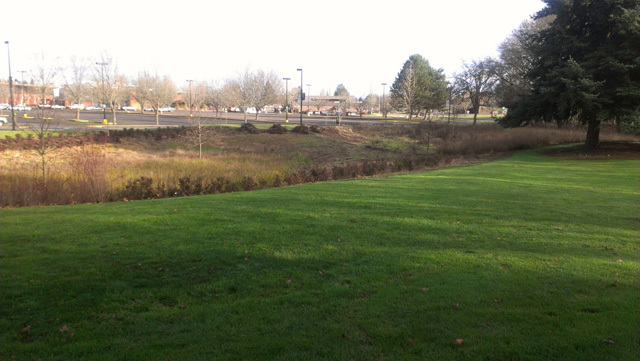 Westech Engineering noted these issues early and worked with Marion County and Chemeketa Community College on a regional stormwater detention solution. By constructing single large detention facilities that provided additional detention capacity, the long term capital and maintenance costs for stormwater management were reduced. The detention facility was oversized so that it could be used to meet the stormwater management requirements for future projects at the campus.